I guess I am doing some compendium pieces with yesterday’s post about a kid playing in the big leagues as today’s film is about a kid managing a big league team. This movie should be a hit with the fantasy baseball players, I mean you do spend countless hours managing a make believe team of players to hopefully be better than the other people who are also managing a make believe team. This will be like a shot of childhood straight to the pleasure center of your brain. For me, this was a natural progression in film growth as we got to see Rookie of the Year in 1993 and Hollywood loves them some similar thematic genres to mine, so Little Big League got made a year later. Surprisingly enough, this was a funny film with a solid dramatic lean to it that made it fairly compelling for a kid centric film. Time to grow up you snot nosed punks. So theme with everyone of these sort of films is about growing up, but never forgetting to that while life is serious, you got to have some fun. I guess sugar coating the crushing reality that the kids will get to experience later on in life makes it a little bit easier to enjoy the film. I kid really, but I am a grinch sometimes. Little Big League came out during that sweet spot in the nineties that had other kids overcoming adversity themes like Sandlot, The Big Green, Angels in the Outfield, Little Giants and jesus christ apparently sports were a big thing between 1993 and 1995. I digress as Little Big League was a lot more mature in it’s story and development. Taking a young kid and placing him in the position of power is daunting but develops a nice growth pattern for the character. Luke Edwards, who was also in The Wizard as The Wizard, is very good in the role of Billy Heywood. Young, energetic, but with a solid head on his shoulders that was a mature character in the world of wacky kid sports movies. I remember enjoying this film a lot because of Billy and how presented himself on screen. Now I was only 9 at the time, but it was better than seeing these kids eat dirt and stuff in baseball movies. Managing the Twins (are they still around?) and bringing the youthful eye to a sport that so many young kids enjoy, makes you feel a bit more connected. 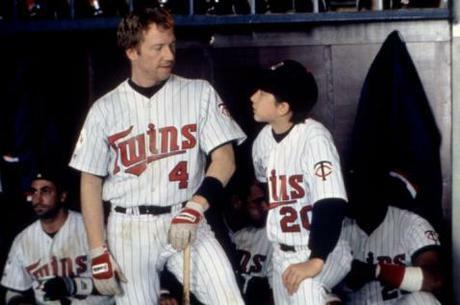 While the film doesn’t have the cast that say Rookie of the Year does, you still got my man TB Timothy Busfield in the movie who happens to mack on the boys mom, which he is pissed at for some reason. I don’t remember why personally, but when TB wants a woman, he gets a woman. Another thing that Little Big League had going for it, while I wrap this up, is that the baseball portrayed in the movie is probably some of the best around. Actual, recognizable athletes pepper the film with appearances and the big league stadiums all add to the awe-inspiring atmosphere. It looked great, even for a kids film. Still, the early, mid nineties were a great time to be a kid as you had a slew of films aimed at you and your sports playing. Little Big League was the more mature of the bunch, but it doesn’t miss out on the laughs which come from the odd ball Twins team.